Roundup Staff Writer NEW DELHI - The United States Army has now disposed of all its surplus property in Burma. Some 150 sales transactions spanning a period of two and one-half months led to culmination of sales this week, Foreign Liquidation Commission authorities for the India-Burma Theater announced today. Tonnage and book value of property were expressed as "considerably less" than the estimated 600,000 long tons and $500,000,000 involved in the recent bulk sale of surplus property in India to the Government of India. An absolutely accurate inventory of Burma material was held impossible due to combat conditions under which much of it arrived and was employed. A 400-mile pipeline, Butler bridges, trucks, bulldozers, tractors, graders, horses, mules, tenting and tens of thousands of other items were included in the sales. The 1,627-foot Irrawaddy Bridge at Myitkyina was given to the Government of Burma in an international goodwill gesture by the Army. This world-renowned structure - called the longest ponton military bridge in the world - has six floating, four movable and three fixed spans. Length of spans vary from 87 to approximately 137 feet. The bridge has two fixed piers, two adjustable piers, one fender piling and is built on seven barges. The Burma surplus property disposal differs in several respects from the sale of United States Army surplus in India. Besides consisting of many separate sales, the project involves actual cash payment in rupees and property went to private interests through negotiations by local FLC officers under guidance of FLC officials at New Delhi. "Most contracts transferring the Burma surplus call for the purchasers to take over the property within 'a short time,'" declared local FLC officials. However, some United States Army property classed as "excess" - as differentiated from "surplus" - remains in Burma to be shipped out. Indian private interests conducting negotiations in Calcutta and Delhi were declared to have dominated the Burma purchases, although there were buyers from Burma and even China. The entire United States Army pipelines in Burma were sold to an individual, an Indian. This bonanza incorporates 401.5-mile and 333.5-mile stretches of four inch pipe, 219.5 miles of six inch pipe and 39 pumping stations containing up to six pumps each. Tankage capacity is 10,200,000 gallons, according to records. ANN’S IN THE SWIM When it comes to selecting bathing suits, and filling them, Ann Miller here, of Columbia Pictures, is quite a gal. She can swim, too. TOKYO - (ANS/UP) - Premier Kijuro Shidehera's cabinet, rocked to its foundation last weekend by Gen. Douglas MacArthur's political purge, went into emergency sessions this week in an effort to salvage something from the wreckage. Although a spokesman for the cabinet said that the government might attempt to remain in power by completely reorganizing previous lines. Tokyo newspapers hailed MacArthur's order as heralding a new day for confused Japan. Writers speculated that the new directives would leave untouched only the premier himself and foreign minister Shigeru Yoshida. MacArthur's directives, in brief, ordered a purge of all militaristic organizations and the men who led Japan into war. Earlier last week MacArthur, making his first overall report on his stewardship of the Nipponese nation, disclosed that the conquered empire probably faces starvation within three months unless emergency food supplies are imported. At least 3,311,000 tons are needed. MacArthur's directives were the second major upheaval to Japan since the first of the year. In a New Year's message to his people, Emperor Hirohito told them that the notion of his own divinity - buttressed by Japanese constitution and law - was a matter of "legend" and "myth." Meanwhile at Honolulu, Secretary of War Patterson answered MacArthur's recent statements to the effect that he had not been consulted on the question of joint Big Three occupation of Japan, by saying that the War Department does not consider it necessary. Patterson said as did Secretary of State Byrnes in Washington, that MacArthur properly has no voice in the making of foreign relation policies. CHUNGKING - (ANS) - Gen. George C. Marshall, approved by both Nationalist and Communist factions as mediator in China's civil strife, emerged from the first session of peace negotiations attended by representatives of the two sides this week declaring, "We have made progress." Gen. Marshall met with Chang Chen, leader of the "Political Science Group" of the Nationalist Government, and Chou En-Lai, leading Communist negotiator. All were smiling at conclusion of the three-hour meeting, in which the first draft of "cease fire" orders were studied. Full-scale negotiations will begin Thursday, when the People's Consultive Council meets formally. The Council reportedly will be confined to discussion of two topics: Peaceful reconstruction of China and the formation of the National Assembly. Meanwhile, fighting was reported. One Chinese Government dispatch announced that Communist forces had been repulsed in an attempt to seize an airfield at Tangshan, coal-mining center on the Peiping-Mukden Railroad. Another internationally-known American was reported in the Far East with the announcement that Claire L. Chennault, famed leader of the "Flying Tigers" in early days of the war, was in the Orient, wearing the uniform of the United States Army. His was quoted as "a secret mission." Chennault denied he was going to command a combat unit in China. At Shanghai, Lt. Gen. Albert C. Wedemeyer announced that American ships would begin moving 26,000 Chinese Government troops into Manchuria before the middle of January. NEW DELHI, INDIA - Application and Officer Evaluation Report forms will be distributed to all headquarters throughout the theater, Col. E. E. Tabscott, Assistant G-1, announced today after President Truman signed a bill authorizing the integration of 8,000 wartime officers into the Regular Army. The originals of the application forms must be in Washington by March 1 and the completely processed forms must leave the Theater by April 20. Interested officers will fill out application forms in duplicate and submit them to their next senior officer, who will prepare the Evaluation Report and forward it with the original of the application to the Adjutant General in Washington, Tascott said. Duplicates of the application form will be sent to a processing center in the Theater to be designated by the Theater Commander. MYITKYINA, BURMA - Recent sporadic outbursts of armed banditry in North Burma reached a near-tragic climax here when operators of a black-market ring threatened to murder a U.S. security detachment officer unless he would give up many thousands of dollars worth of contraband GI property seized by his men, it was reported this week. The officer, who was not identified, received the threat after refusing to accept a bribe to release the contraband. He told superior officers the property involved included American cigarettes, parachutes, blankets, clothing, sugar and rations found on two trucks abandoned by their Asiatic drivers when security men stopped the vehicles to question the drivers. The trucks were placed under strong guard. Shortly afterward, it was reported, the officer in charge was approached by men representing themselves to be representatives of the black-market ring. The men offered to "buy back" the supplies, explaining that it had taken 10 racketeers six months to accumulate the property, much of it by theft. CIGARET PRICE HALVED IN I-B The price of cigarets in Army post exchanges throughout the I-B Theater was cut to one rupee a carton this week, according to an announcement from the office of the Theater Post Exchange Officer. The officer refused to accept a bribe and the men left, only to return the next day to repeat the offer which they said they had been authorized to make. Again the officer refused and ordered the men away. The following night the officer was visiting a friend in Myitkyina Town, the report said, when a group of Asiatics went to the house and asked one of the grown sons in the family to accompany them. An hour later the man returned and said he had been taken to a meeting of members of the black-market ring at a restaurant here. He quoted the racketeers as saying he was approached because of his friendship with the officer, a lieutenant, who would either have to release the two truckloads of property immediately "or else..."
The officer, on being informed, reported to his superiors. Extra guards were placed with the contraband. Attempts were made to track down members of the ring, who apparently withdrew from the area to escape arrest. A year-end Roundup survey to determine what is yet required to close-out property remaining in the India-Burma Theater indicates that since V-J Day 335,000 tons of common-user and AAF technical supplies have been dispose of, leaving 771,000 long tons in the Theater on Dec. 30. Of these, roughly 100,000 tons must be shipped out of the I-B to the U.S. and other theaters, it was reported. The recent agreement for bulk sale of surplus property to the Government of India covers approximately 50 percent of the 771,000 remaining. It is estimated that other sales through FLC will total approximately 18 percent of the 771,000 remaining. Over and above the goods to be disposed by sales, 256,000 tons remain, it was said. Theater troops will use up slightly more than 100,000 tons. Thirty thousand tons are ammunition which will be destroyed locally or dumped at sea. Disposition orders are still being awaited for 20,000 more tons. The balance - 100,000 tons - must be shipped back to the U.S. or to other theaters, under War Department orders. Theater headquarters spokesmen said that War Department policy now is to ship back only those items which are critically needed by the Army, or for civilian reconversion. A tremendous shipping job was saved when the War Department, at Christmas time, took most general purpose vehicles (6x6 trucks, jeeps, etc.) off the list of items to be moved out of India. Primarily only special purpose vehicles, like heavy engineer equipment, will have to be put on the boats now. Of the 100,000 tons to be shipped, 90,000 are already in the Calcutta area. The remaining 10,000 tons are concentrated principally in Assam. In the four months since V-J Day, 133,000 tons of excess property were shipped out of Indian ports. All figures are quoted in long tons, which equals 2,240 pounds. RENO, NEV. - (UP) - Culminating a romance that began in a Bombay canteen in 1942, Mrs. Lucy Malcolmson, 34, of New York City said this week she plans to marry Lt. Col. Gregory "Pappy" Boyington, Marine Corps flying ace, when she obtains a divorce here next week from her General Motors executive husband. The tall, attractive brunette said she met Boyington, who equaled Eddie Rickenbacher's World War I record of 27 planes shot down, when he tripped over a rug in a Bombay canteen. The marriage, Mrs. Malcolmson said, will take place in Reno on Tuesday or Wednesday. Mrs. Malcolmson said that at the time she and Boyington met he had just resigned from Maj. Gen. Claire Chennault's "Flying Tigers" and was on his way back to the United States to join the Marine Corps. She was with the St. John's Ambulance Service moving wounded men aboard ships. "I was in the canteen when I heard what sounded like a wolf call," she laughed. "Greg came toward me and tripped on a rug. He grabbed me by the knees to break his fall and after that no introductions were necessary. "All Americans over there looked like wolves," she explained, "so I didn't pay any attention to him until he fell." Next stop: Hollywood? 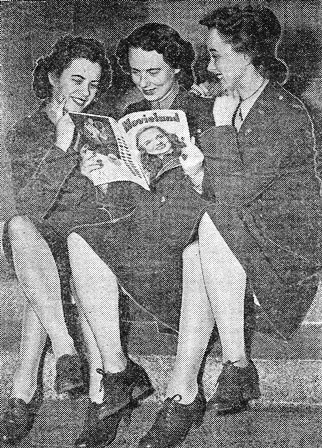 Three WAC officers in Washington's Pentagon Building thumb through a Hollywood magazine and wonder if one of them may yet wind up in movies. Left to right: Lts. Betty J. Venerable, Irene Kelley (formerly stationed in India) and Ann Murphy. A WAC formerly stationed in Delhi and Ceylon loomed today as the beautiful unidentified girl described in the Roundup recently who has only to identify herself and get out of the service to be given a Hollywood screen test. 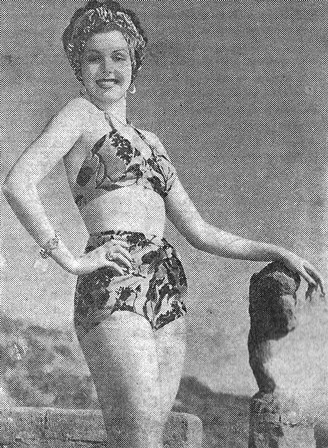 According to Dave Richardson, Time-Life correspondent in India, the description of the lovely girl ties in completely with a T/3 Irene Kelley, whom he photographed in Ceylon for a photo layout in Yank magazine, while he was working on that publication about a year ago. The WAC whose identification is sought is working in an office in the Pentagon Building, Washington, where a movie producer, Jules Levey, saw her and asked her for directions to an office. Levey, late for his conference, dashed off and has since been trying to find the WAC in the huge building to give her the screen test. "Yes," said Richardson, as he read about it in the Roundup, "I am sure Sgt. Kelley is the girl he is looking for. A brunette with a gorgeous smile, blue eyes, about five-foot-three. The description fits and I am even more positive because I saw her in the Pentagon Building myself when I was there two months ago." Richardson said Sgt. Kelley was a T/3 with SEAC in New Delhi, and then was transferred to Ceylon to work as a secretary. Then, he said, she qualified for OCS and returned to the States a year ago just about at the time her photo and those of other WAC's appeared in Yank. MYITKYINA, BURMA - Surplus GI property, plus American gratefulness, plus Gurkha and Kachin ingenuity, may combine here in North Burma to reconstruct war-torn life and bring many modern advantages heretofore unknown or unobtainable to the people of the Mogaung valley. During the war, Gurkha and Kachin communities of North and Central Burma performed valuable feats of valor against the Japanese. The Kachins, of course, were enlisted in the famous American-Kachin Rangers under OSS Detachment 101. Many Gurkhas, during the siege of Myitkyina, escaped from the Jap-held town, and voluntarily joined the American Forces, fighting with us all the way to Lashio. Now the people of this valley face tremendous problems in reconstructing their war-shattered homes and lives. The Jap occupation robbed Burma of four years of production. Always dependent on the South Burma cities economically, the disruption of transportation between Rangoon and North Burma made the situation even worse. With everyday necessities of life scarce as hen's teeth, the black market in Myitkyina, Bhamo and other northern towns still flourishes today, putting the prices of materials needed for reconstruction far beyond the average person's reach. It was in this situation that American Army officers who served through the Burma campaign determined to cut through red tape and partially repay the valiant Gurkhas and Kachins by exerting every effort to assist them in acquisition of Army surplus property. The Gurkhas and Kachins were never among the wealthier groups in Burma. So it took a high degree of initiative, imagination and organization on their part to raise the money necessary to take advantage of the opportunity. 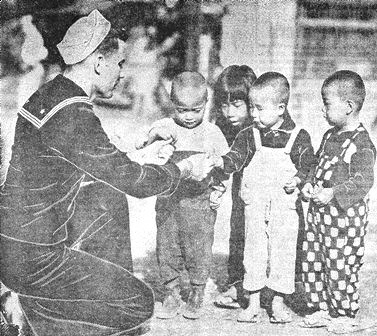 The Kachin community established the Kachin Cooperative Society, largely through the efforts of former members of the OSS rangers. Building materials and transportation are the principal needs of their people, so the Society has already purchased numbers of GI vehicles and much engineer property. The Kachins are largely a hill people in the area north of Bhamo. Kachin villagers had to walk ___ for Rangoon and Mandalay were available. Even then goods brought up from the southern centers by northern merchants brought exorbitant prices. So the Kachin Cooperative Society is now hard at work establishing "bus" lines during the dry season from remote areas like Sumprabum and Fort Hertz, way back in the hills, to the railroad centers at Myitkyina and Katha. Trucks are used as buses. The Kachins also plan to run their own trucks to Rangoon, purchase directly there and then make goods available to their people at far lower cost than before the war. Attar Singh, who holds a degree in chemistry, has had papers published in the American Journal of Physical Sciences and taught for seven years in Judson College in Rangoon, told me of the plans of the Gurkha community, through their cooperative, the Gurkha Economic Stores. The Gurkhas have already raised 150,000 rupees to purchase two GI sawmills and a fully equipped GI carpenter shop. There was only one sawmill in the Myitkyina area, rich in teakwood forests, before the war and that has been completely destroyed. Now the Gurkhas plan to build a real wood-working industry in the Mogaung Valley. Mr. Singh estimates that the sawmills will give employment to 2,000 people. They have already hired all the available skilled carpenters - only 28 could be found - for the carpentry shop. The Gurkha Economic Stores plan to institute an apprenticeship program in their carpentry shop and teach scores of young Gurkhas this skilled craft. GI's who have fought with the Gurkhas and Kachins down here are really pulling for their success. And the GI's will tell you - that if it's humanly possible to rebuild a better life in this bombed-out, burned-out, black market ridden valley - the Gurkhas and Kachins have the guts and the brains to do it. HQ., AAF, CALCUTTA - Central India Air Depot reached the end of the line recently when it ceased operating as an AAF air depot. The installation at Agra is now being used as a collecting point for excess and surplus property, according to an announcement by Maj. Gen. T. J. Hanley, Jr., AAF India-Burma commander. When the first contingents of AAF troops arrived at Agra in July, 1942, all they found was an open dairy field on the edge of the Sind Desert. Three and a half years later, when the final curtain was drawn, the Air Depot had grown into a full scale overhaul and repair base second to none of this command. It was no longer dairy land, but a large installation for mechanical surgery. This depot was the only one charged with complete overhaul and repair of C-46s, the giant cargo carriers which bore supplies into China. From the barren desert grew barracks, office buildings, service clubs and a swimming pool. A radio station was christened VU2ZW, an instrument of pleasure for GI's and a constant source of interest to the tastes of Indian personnel. Like the civilian employees at the Hindustan Aircraft Plant in Bangalore, they had to start from scratch. With the air of gestures and thousands of "Nai Malum," the GI-Indian team began gearing up the production of the depot to the point where 13 C-46 "Commandos" were being completely torn down and re-built in a month. Supplies weren't easy to obtain and spare parts were a constant headache. 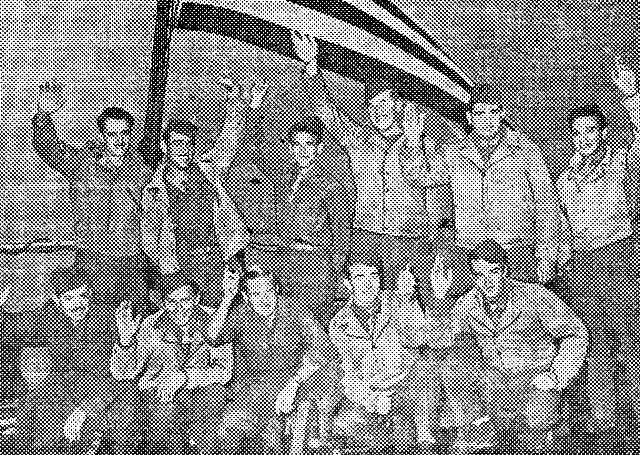 So to straighten out this "kink," the men of the depot built a foundry, which not only manufactured parts of the C-46, but also moulded any spare part not otherwise available in the Theater. CALCUTTA - Boasting five former All-Americans the Calcutta All-Star football team submerged the Panagarh Ramblers, 36-0 in the tough "Finger Bowl" game on the Maidan New Year's Day. Ten thousand persons witnessed the classic. The Calcutta outfit hit for a score the first time it took possession. With the ball on the Calcutta 40, Lewis Saban (a former Indiana ace) faded and passed 35 yards to Bradley, who stepped off the remaining distance. It was the same story a few minutes later as Saban passed to Billy Hillenbrand, famed Hoosier, with the play covering 50 yards. In the second quarter, Calcutta came up with some legerdemain off the 'T' formation. Chet Chesney centered to Saban, who lateteralled to Hillenbrand. The latter uncorked a pass intended for Charles Jacoby but Czar finally snagged the ball for an overall 40-yard gain. The drive carried to the Panagarh eight, at which point it fizzled. However, it was a different story a moment later. Wright's pass was intercepted by Saban at midfield and then Hillenbrand warmed to the occasion. He passed to Cox for 15, then to Chesney for five yards. Hillenbrand climaxed the march with an end run, with Saban contributing some neat downfield blocking. Chesney intercepted another Panagarh pass in the third frame to give Calcutta possession on the enemy 25. Saban flipped to Jacoby for the score. The remainder of the third quarter was a wild exchange of intercepted passes. The play of the game was recorded in the fourth quarter. Here's how it looked: Calcutta used a wide spread formation, the ball was snapped and four men wandered into the Panagarh secondary. Five others floated to the backfield as Saban took the ball. He lateraled to Hillenbrand, who turned and ran 30 yards across the field. Hillenbrand then rifled a toss to Jacoby, playing dead man on the other side of the field - but he dropped the ball. The play was repeated on second down and was good for a score. Scottie gross was on the receiving end. On the very last play, Hillenbrand lateraled to Saban, who passed to Barnett for the final tally. CALCUTTA - Johnny Nuttall, withstanding a first-round barrage, decisioned Walter Kahookeli in the main event of the Monsoon Square Garden fight card before 4,000 patrons last week. The verdict thereby snapped Kahookeli's sensational string of wins - and Nuttall made the verdict convincing and absolute. He took all Kahookeli could offer in the first round, then hammered the merchant mariner all over the ring to have him woozy in the final stanza. Nuttall scored repeatedly with left leads and right crosses to the body. In all fairness to Kahookeli, he as operating at an 11-pound disadvantage. The ringsiders agreed it was the case of a good little man against a good big man. Another bout that kept the fans steamed up brought together a pair of heavyweights - namely, John Mays of Camp Howrah and Toledo, Ohio, and Chester Szymanski of the 68th General Depot and Bridgeport, Conn. It was Szymanski's first showing in Calcutta - though he has a wealth of pro experience and did a stint as sparring partner for Billy Conn - and he made it a successful one. Mays had a mighty edge on the first round. He dumped Szymanski on the ropes and Chester rolled to the floor for a nine count. Mays went after him like a wild bull in the second heat and made the mistake of dropping his defense. Szymanski uncorked a right that had Mays staggering for the rest of the round. Came the third round which developed into a sensational toe-to-toe battle. They hit each other everything but the ring stools and the bell was sounded for a couple of seconds before the pair ceased fire. Szymanski was awarded the decision for his staunch comeback. Making his first Garden appearance since the Theater tourney in April, Featherweight Champ Aaron Joshua took a clean-cut victory over Lucius Wilborn, of Camp Howrah and Detroit. Wilborn had an early edge as he opened a cut on the side of Joshua's face, but Joshua came back to impress Wilborn with his boxing skill. In a light-heavyweight affair, Gino DiPartsio of Italy took the nod over Larry Palmer of Poughkeepsie, N.Y. The first five bouts of the evening were a team match between the Maharajah of Burdwan's outfit and a similar team recruited by the U.S. Army. The dual meet ended in a tie, with two wins apiece and a single draw to tie up the issue. Most notable of the matches saw Bill Stonebody, fighting for the U.S. Army though he belongs to the Royal Indian Navy, out-punching Peter Bose of the Maharajah's team and the Bengal Boxing Association. The other U.S. winner was, strongly enough, Stonebody's adopted brother, Dillon Smith. He decisioned the experienced Baker Ghose in a close bout. HQ., AAF, CALCUTTA - Two more Air Service Groups are being inactivated, the 54th and 383rd, it was announced this week. The 54th began its I-B operations in February, 1944 at Tezgaon as part of the famous "Project 9," which was later designated the 1st Air Commando Group. During the period from March to May, the 54th played a major combat role by supplying and maintaining the Wingate-Cochran airborne invasion of Burma. With the progress of the war in the Far East, the 54th moved deeper into Burma, while detachments remained behind to service air-lift to China. From November, 1944 to August, 1945, the group supplied and handled 42,337,082 gallons of gasoline which was flown over the "Hump" to units of the 14th Air Force. The 383rd arrived in India on Jan. 23, 1945 and was assigned the task of assisting in the evacuation of the 20th Bomber Command from the Matterhorn area. When the war in Burma was reaching its final stages, tactical units of the 10th Air Force were sent to bases in the Matterhorn area, there to stage prior to redeployment in China. The job of servicing these organizations was handed to the 383rd. The war ended while the 10th's tactical units were still staging. To the 383rd Air Service Group it could mean but one thing: Taking charge of the disposition of the 10th's aircraft and all that goes with it. With the inactivation of these two Air Service Groups, their mission now complete, low point men will be transferred to other units, while 'high-pointers' will begin the long trek homeward. CALCUTTA - Here's a few hints on Kanchrapara, where the processing of homeward-bound GI's will center following the scheduled closing of Malir this month. Take a flashlight along, for some of the tent areas have no illumination. Take a comforter or mattress if one can be obtained, for it is colder than hell's half acre out in the tents. Make sure of a canteen filled with water, for it is a long dusty trip out to the vast sprawling area of the processing center. The processing itself is a simple matter. It takes between three and five hours, depending on how fast you can fill out the cards and how well your luck holds at the clothing checking sector. An officer does the instruction at the first table as to how to fill out the first card, which has two duplicates. After that you are handled by GI's at the other tables. From personal observation, they are courteous, hard-working Joes who will go out of their way to help. The only bottleneck is at the supply table. This is inevitable as the checking of the clothing form takes more time than the other documentation. But this writer saw two GI's in supply hold over a half hour of their chow time to speed the men on their way. The truck drivers are strolling cab drivers, except there is no charge. Drivers stop countless times to pick up GI's along the roads to help them to their destination. The MP's run an unofficial tour to Calcutta for men on pass, stopping conveyances at the gate to get them lifts. Kanchrapara is no Paradise. It hasn't the comforts of rear echelon installations. But men are rapidly being shuffled out and the permanent party there is doing its best to speed you on your way without too much red tape. SHANGHAI - (UP) - The Stars and Stripes said here last week that two American business men traveling in China as consultants for Rep Maury Maverick (D.-Tex.) have been thwarted in an attempt to make a "quick kill" in smuggling cultured pearls. The men were not identified but were said to "travel in the highest government circles." They were caught while attempting to use government transportation to accomplish their personal mission. The Stars and Stripes said that Maverick, chairman of the WPB's Small War Plants Corp., had gone to China on an inspection tour. The paper said it learned his two advisors were seized by government agents here as they were about to take-off for the States on the ATC Globester. One of the men was said to be carrying $25,000 worth of cultured pearls. Government agents were reported to have followed the pair around China, gathering information as to their activities before closing in to make the arrests. MYITKYINA, BURMA - The remote, beautiful wild hills of North Burma that provided pre-war-adventure for big game hunters; that, during the war, made Merrill's Marauders' job one of the toughest in the world, are still full of adventure for the last handful of GI's left here. Take the story of T/5 Floyd Roberts, Pfc. Kenneth Wendell, Pfc. Ernie Goodwin and Capt. Donald Rider. These four men work for the 105 QM Graves Registration Unit. Their mission was to recover bodies of Hump flyers who have crashed in the snowy stretches of the Himalayas beyond Fort Hertz. Heavy snows in the area made it impossible to reach their goal. So, on December 19, they started back down the long road from Fort Hertz to Myitkyina in two jeeps, Capt. Rider and Pfc. Goodwin in the lead. About 4 o'clock that afternoon, Wendell and Roberts in the second jeep, proceeding at under 10 miles an hour down the jungle trail, felt the road slip away about 20 miles outside of Sumprabum. Their jeep tuned over three times, and landed at the bottom of a 30-foot gully. So sharp were the curves that the two men in the lead jeep never realized the others were not behind them. Three and a half miles down the road the lead jeep too lost its "footing" and became mired down. Then Capt. Ritter and Pfc. Goodwin discovered their buddies were not following any longer. Meanwhile, at the scene of the first accident, Pfc. Wendell had broken his leg. Cpl. Roberts, badly shaken up, but not injured, started down the road for help, after administering first aid and leaving Roberts with a rifle. On the way he met Capt. Rider. Rider and Roberts retuned to the lead jeep for morphine and a first aid kit, then hiked back 3½ miles to where Wendell lay in pain. When they arrived back on the scene, they found seven Kachins on the spot. The Kachins had already constructed a litter and were tenderly carrying Wendell to a more comfortable spot on the road. With the help of the Kachins, Capt. Rider and Roberts tended Wendell through the night, while Goodwin walked to a ferry seeking coolies to help get the lead jeep back on the road. Even with the help of coolies, the job couldn't be done. So the party sent for work elephants which the Kachins told them were fairly close. With the injured man lying on his road-side litter, 17 hours passed before the elephants arrived. The big beasts finally turned the trick, and the lead jeep was back on the road. But then the long, hard drive to Myitkyina with the injured Wendell had barely begun. The party left the scene of the accident on the morning of December 20. By nightfall they made Sumprabum where an Indian doctor replaced the rifle that had kept Wendell's leg immobile, with a more adequate splint. On the 21st, the party made 50 miles over the tortuous road to Kwapang, where they rested the night. After their third full day of travel - December 23 - the jeep finally pulled into Myitkyina just as darkness fell. And finally, on December 23, four days after the accident has occurred, Wendell was flown to the hospital at Chabua. Morphine, administered occasionally during the four day trip, had kept him fairly comfortable. Cpl. Roberts back in Myitkyina and still badly shaken up said, "We certainly have to be grateful for the Kachins. They are some of the finest people I have ever met. They'll do anything to help you, and never expect a thing in return." UNCLE JOE SENDS GREETINGS TO I-B "Uncle Joe" Stilwell is glad he hasn't been forgotten in the I-B. "Many thanks for your Christmas and New Year's greetings. Glad to know I am not forgotten in the I-B. My best wishes to you and all I-B personnel for a Happy New Year to be spent, largely, in the USA." KARACHI, INDIA - Troop movements through the port of Karachi in its closing days are now being recorded and broadcast by Radio Station VU2ZW, GI station for the Karachi area, by Sgt. Jim Woodruff, Jr., of Columbus, Ga., announcer, and T/5 David R. Anderson of La Follette, Tenn., technician. Woodruff, station manager, dreamed up the idea for the port program early in December. Built around the theme of "You Last Assignment in India," the program is entitled "Objective America!" Troops loading on the USS General Ballou Dec. 10 were the first to be interviewed by Woodruff. With remote facilities set up on Karachi's East Wharf by Anderson, the program included a pickup of troops' names being called as they walked up the gangplank, short interviews with men loading on the ship and an interview with the ship's captain. Since the loading of the Ballou, similar programs have been carried out with the USS General Taylor and the Hawaiian Shipper. The program will continue to be one of the foremost features of VU2ZX until the final troopship leaves Karachi Jan. 22. SHANGHAI - (UP) - U.S. Army Headquarters said this week that approximately 25 officers and enlisted men have been arrested on charges of stealing more than $50,000 worth of Army supplies and selling them in the black market. The soldiers are awaiting trial. They were arrested during a series of raids by military police. Army food, clothing and medicines were among the Government supplies stolen recently. The announcement emphasized that the raids had failed to uncover evidence that an organized ring of black marketeers exists. Lt. Gen. Albert C. Wedemeyer cracked down this week on American soldiers and civilians attached to the Army, who have been trying to make private business deals on the side. He ordered all military personnel in China and all persons subject to military law to refrain from business or professional activities not directly connected with their military or official duties. Wedemeyer ordered that every person under his command submit a certificate of compliance with this order. The order was issued after it was learned that some persons were using their official positions to make business deals for current profit or for the period after they are discharged from the service. The Roundup is a weekly newspaper of the United States Forces, published by and for the men in Burma and India, from news and pictures supplied by staff members, soldier correspondents, Army News Service and United Press. The Roundup is published Thursday of each week and is printed by The Statesman in New Delhi and Calcutta, India. Editorial matter should be sent directly to M/Sgt. John C. Devlin, Hq., U.S.F., I.B.T., APO 885, New York, N.Y., and should arrive not later than Saturday in order to be included in that week's issue. Pictures must arrive by Friday and must be negatives or enlargements. Stories should contain full name and organization of sender. Complaints about circulation should be sent direct to Capt. Drexel Nixon, Base Section APO 465, New York, N.Y. Units on the mailing list should make notification of any major change in personnel strength or any change of APO.